Directions: These questions deal with box and whisker plots. 1. Jason saves a portion of his salary from his part-time job in the hope of buying a used car. He recorded the number of dollars he was able to save over the past 15 weeks. Which box and whisker plot represents this data? (a) What is the value of the third quartile? (b) What is the median score? (c) What percent of the values are less than 4? (d) What is the range of the data presented in the box plot? 3. A movie theater recorded the number of tickets sold daily for a popular vampire movie during the month of December. The box plot below shows the data for the number of tickets sold, in hundreds. Determine whether the following statements are TRUE or FALSE regarding this box plot. 4. The box plot shows the ages of people attending a music concert. (a) Which interval contains exactly 50% of the ages? (b) What percentage of the ages are 15 or older? (c) What is the median age? 5. 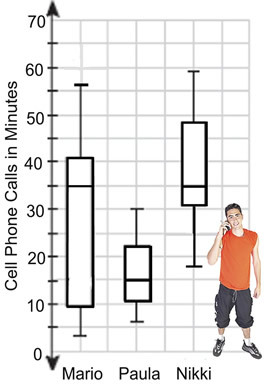 The box plot shows the lengths of cell phone calls made by three students in a one week period. All of Nikki's calls were longer than all of Paula's calls. Paula made the fewest number of calls. Mario made 50% more calls than Paula. The median length of Mario's calls is equal to the median length of Nikki's calls. (a) Which interval represents the interquartile range, IQR? (b) What percentage of the data lies in the IQR? (c) Which interval could be described as being the most "clustered" section of the data?